Railpictures.ca - A.W. Mooney Photo: The days of CN’s “Bullet-Nose Betty” 6060 getting rather long-in-the-tooth as she is now being assisted by VIA 6539 on the twice weekly tourist run from Toronto to Niagara Falls and return. In this view, one can see the Welland Canal bridge 6 counterweight in the background, and crossing gates returning to their upright position at the Glendale Av crossing, as the Toronto-bound afternoon train roars past the old Merritton station (destroyed by fire Oct 1994). Some of the local population watch in admiration. That is the old GM plant in background on the left; foreground freight cars are in now-taken-up Merritton yard, while local switcher CN 7168 waits it all out. | Railpictures.ca – Canadian Railway Photography – photographie ferroviaire Canadienne. Caption: The days of CN's "Bullet-Nose Betty" 6060 getting rather long-in-the-tooth as she is now being assisted by VIA 6539 on the twice weekly tourist run from Toronto to Niagara Falls and return. In this view, one can see the Welland Canal bridge 6 counterweight in the background, and crossing gates returning to their upright position at the Glendale Av crossing, as the Toronto-bound afternoon train roars past the old Merritton station (destroyed by fire Oct 1994). Some of the local population watch in admiration. That is the old GM plant in background on the left; foreground freight cars are in now-taken-up Merritton yard, while local switcher CN 7168 waits it all out. Almost 37 years later, the area we see here has certainly changed. This image represents Merritton – or at least this particular area of it – as I remember it. I crossed the tracks seen here so many times – especially during my four years at Merritton High School, just to the left of the area we see here. A bit more information I found regarding this train. It was the very last time CN 6060 would visit the Niagara Peninsula. The NRHS sponsored trip had 13 cars, inc three Roanoke Chapter x-N&W cars; the Fort Mitchell, the 501 and the club’s observation car, 3305, carrying the markers. Info from a 1986 F. Erie RR Museum calendar. Thanks, BEM’r. I recall two tracks along the Thorold line; not sure if they were still in place down by Thorold station when I photographed it in 1974. Did not realize the wye at Clifton was such a recent project. The “Down” track overpass was removed in early ’76. The reason there are two tracks – one on either side of the double mains – is because there were two tracks to Thorold on the west side of the canal. Using Arnold’s photo, the track on the right that turns away, was referred to as the ‘Up’ track; the track on the left, that came overhead of the Grimsby Sub and then connected beyond the station, was the “Down” track. In other words, trains from Hamilton (and beyond) would go to Welland, Port Colborne and Ft Erie via the “Up” track; and trains in the opposite direction would come from Ft Erie etc and use the “Down” track. This lasted until 1968/1970, when the canal bypass was built and CN changed the former Welland Sub into the Stamford Sub and built a connection at Clifton. This allowed them to stop using the “Up” and “Down” tracks and go via Clifton, with less severe grades. Before that, there was no way for a train from Toronto or Sarnia/London to get to Port Robinson and beyond by travelling to Niagara Falls Yard (without running around themselves). The new connection at Clifton made this possible ( Grimsby/Stamford connector). It’s been possible lately, with 422 being late and all. Another one rolled by around 1 last week. Awh!!!! Joe. Great idea. All we need is a westbound afternoon train…..not an easy catch these days. There’s a fairly recent photo – here at Railpictures.ca – of the area seen here, where the Merritton train station used to be, which could be paired with Arnold’s photo in/on the Time Machine. Arnold, I have a younger brother who – as a kid – loved to stand on Walnut Street with my mom and watch the trains and the goings-on at the station. He – too – loves this shot. Thanks for the kind words, Joe. Then I guess I should say I haven’t really decided which my personal favourite is on Railpictures, but I lean toward Bill Hooper’s Montreal River AC shot. My favourite of my own work posted here, well, nobody seemed to like it. ) So it shall remain a secret. There are a lot of terrific photos here at Railpictures.ca., but this one remains my favourite. Just about everything in the shot sparks a memory. The only thing missing is my alma mater just to the left. I found a old photo where you can see the bridge just a tad bit in the background of it. Not the best of photos, but it’s the best I’ve found. I’ve tried to find photos of those particular lines and areas I mentioned – here at Railpictures – but haven’t found any. The folks at the Thorold and Beaverdams Historical Society have some terrific shots – on their website – of the trestles which were once such a dominant part of the skyline in Thorold. You had trestles crossing over St. David’s Road, Ormond, Front and Albert Street, and the track was elevated running parallel to Front Street. Thorold sure looks different without those trestles. My primary interest back then was stations, and I spent most of my spare time driving around looking for them. St. Catharines area has an amazing amount of railroad history..
Actually, I explored up there in the Winter and the tracks are still up there, just without the rails. I know the remains are known as “Death Wall” now. Arnold, do you have any shots of the trains on the old NS&T railway line – running from Merritton into Thorold – or on Townline Road, where Merritton and Thorold meet? There are a few interesting such shots on the Internet. Thanks to my parents owning and operating the little diner on Merritt Street – decades ago – across from the paper mill just north of Townline Road, I grew up with trains – or at least boxcars – just across the street every day, as a kid. Gotcha. I wasn’t sure when the bridge came down but I recall using that location to shoot CN 6060 coming off the Welland Canal bridge many years ago. A bummer its gone. “Bum Bridge”?? We can’t go there as this conversation might affect the purity of the under 16 crowd on this site. ) I remember taking pictures from that bridge but don’t know if I have any OF the bridge. Any rate, they are not good enough shots for the likes of RP.ca. You’re talking quite a few years ago already. The baby Jays in town are ancient history, as are the baby Yankees in Oneonta. That was my old high school – where the Baby Jays played. Had you turned a bit to your left, and taken another photo – after the one above – you’d have had Merritton High School in the shot. Wish there was a photo of the rail overpass – known as “Bum Bridge” – which crossed over the two sets of tracks heading over the Welland Canal. Boy, there were/are some hair-raising stories associated with it. Joe: I did not go to school in St. Catharines, so I am guessing your school was where the ballfield out back hosted the City Baseball Team at one time? I used to go to games and cheer Oneonta (NY) when they came to town, but that was quite a long time ago already. Mr. Mooney, your photo here certainly caught my attention. For four years – usually four times a day (if I wasn’t skipping my afternoon classes) – I crossed the then-existing four raillines at Glendale on my way to or from Merritton High School, in the early 1970s. You weren’t far from my old alma mater when you took that shot – presumably from the Merritt Street bridge over the tracks. @headtailgrep Yes. Part of the trackage from the other line still exists. When you cross over Glendale Ave, and after the mainline you cross a single track, that’s what the single track was. The other line of the Thorold sub did exist back then too. I don’t know why they had 2 different lines at the same time. 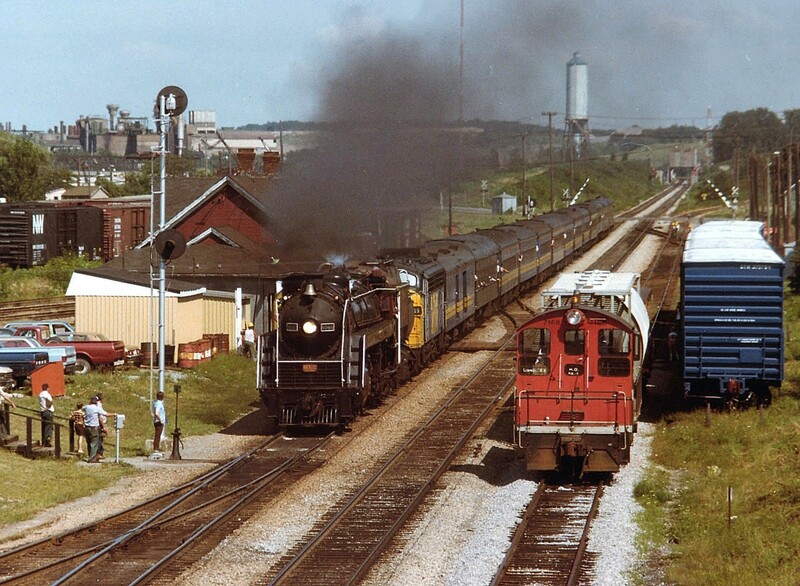 So what you guys are saying – the Thorold sub used to cross the mainline by way of a bridge (near that water tower), and in 1976 CN removed the bridge and put in the switch and new curve to the Thorold sub around that time? Yes, CTP: Merritton is to St. Catharines as Lakeview is to Port Credit or Nepean is to Ottawa. Separate communities in which the big fish swallows the smaller over time. Nice, very nice. That shot is full of detail and action Arnold. Was Meritton part of St. Catharines? Never made it there but glad you posted this to show me what I missed. Yes, Docta. I forgot about that old trackage when penning the caption for this photo. Thanks for pointing it out. The supports are back there still, covered in vine and other wild foliage; the trestle bridge over the mainline was removed I believe early 1976.